Place all the tomatoes, garlic, onion, marjoram, oregano, cloves, salt, and pepper into the jar of a blender and puree until completely smooth. Heat the oil in a saucepan over medium heat. Once very hot, but not smoking, pour in the tomato sauce. Cover partially with a lid and cook for 5 minutes, until the sauce thickens and seasons. Add the chicken broth, stir, and cook a couple minutes more. Turn off the heat and set aside. Heat a comal or skillet over medium heat. Once hot, add the chiles de arbol, and toast for about 1 minute, flipping them around as they do. Remove and set aside. Place the tomatoes and garlic in a saucepan, cover with water, and place over medium-high heat. Simmer for about 10 minutes, until the tomatoes are cooked and mushy. Using a slotted spoon or tongs, transfer the tomatoes and garlic to the jar of a blender, along with a cup of their cooking liquid, the toasted chiles de arbol (you can add gradually if you choose), onion, vinegar, cumin and salt. Puree until completely smooth. Taste for vinegar, salt and heat, and adjust accordingly. Heat the oil in saucepan over medium heat. Once hot, add the pureed sauce, partially cover, and cook for 2 to 3 minutes, until thickened, darkened and seasoned. 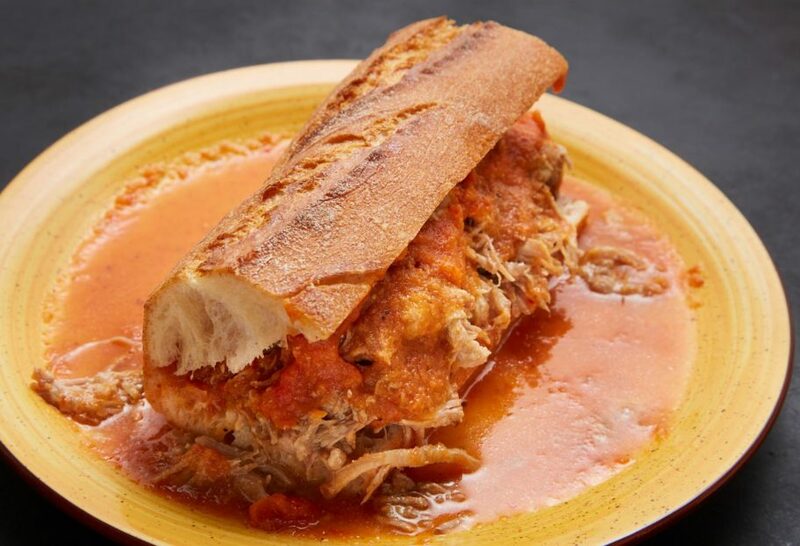 Have the warm carnitas shredded, the bread lightly toasted and the salsas heated. Slice the briotes to create a pocket for the filling, without cutting all the way through. One at a time, with the opening towards the ceiling, tuck in copious amounts of carnitas. Cut in half, place in a soup bowl or deep plate that can withhold sauces. Pour the tomato sauce on top first, and then ladle on as much spicy sauce as each guest desires. I am wondering if you think this could be done with smoked turkey for Thanksgiving? Should be super yum, Rebecca! TENGO POCO DE VER TU SHOW. I AM IN LOVE WITH ALL THE RECIPES. Hi Ms. Pati! What type of brad are you using for this? It looks wonderful and crusty! You can use a birotes or crusty baguettes…whichever you are able to find. Enjoy the torta, Yenna! This just may be my favorite sandwich. We tried it with carnitas-style chicken thighs. YUM. Such a great sandwich…so glad you like it Kalynn. Made these tonight and they are amazing!! You are the best Pati! I cannot eat dairy. Do you have a substitute which would still carameliza and tenderize the pork? Is it the lactic acid and the milk sugars which accomplish this? This makes me think of home. ¡Gracias, Pati! Oh I hope it brings back such great memories of home, Santiago.